Added by Darian Bolin on March 16, 2016. You know that saying “Nobody is useless, you can always serve as a bad example?” The career of writer/director M. Night Shyamalan is a perfect example of that. He went from being compared favorably to Spielberg after the release of The Sixth Sense, to a gradual and public downfall culminating with his recent releases The Last Airbender and After Earth being called among the worst movies of all time. So what happened? What happened to turn “the next Spielberg” into a subject of ridicule? How did a young filmmaker with such promise and potential become a laughingstock? Full spoilers for the plot and endings of all of Shyamalan’s movies are below. Tread carefully if you haven’t seen the films mentioned and want the experience of seeing them for the first time to be unsullied. This was where it all began (at least as far as most of the world is concerned. Before this, Shyamalan wrote and directed two obscure low-budget movies that, compared to his later output, feel almost like they’re directed by an entirely different person. We’re not gonna count those). Night Shyamalan’s major debut film, The Sixth Sense, was released into theaters on August 6, 1999. Upon its release, it was critically acclaimed and nominated for several Academy Awards, including Best Picture and Best Director for Shyamalan. One of the things The Sixth Sense does really well, and part of what makes it such a good movie, is its ability to generate tension, fear and suspense simply by the scene it sets. The cinematography makes use of a lot of static shots and long zooms, giving the viewer a feeling of unease. My favorite example of this is in the famous “I see dead people” scene. As Cole, the haunted child portrayed by Haley Joel Osment, talks about the dead people he sees who “don’t know they’re dead,” the camera slowly zooms in on Malcolm, the child psychiatrist character played by Bruce Willis who, as revealed at the end of the movie, is actually dead and doesn’t know he’s dead. Shyamalan takes full advantage of Malcolm’s unreliable narrator perspective to keep the audience in the dark about the now-iconic ending. Because we see the story through Malcolm’s eyes, seeing only what Malcolm chooses to see, things that would clue us in were they in another character’s perspective are gone, leaving an experience of discovery for both us and Malcolm. Long story short, The Sixth Sense is a fantastic movie, and after its release the world wondered what Shyamalan would do next. On November 14, 2000, he gave them an answer, when Unbreakable was released into theaters. To make things brief, Unbreakable is a superhero movie that doesn’t follow the structure of a superhero movie; rather than the usual discovery > acceptance > battle plotline of other superhero/supervillain origin stories, this movie builds its entire plot off of the discovery aspect. Bruce Willis, returning from The Sixth Sense, stars as David Dunn, a lowly security guard who emerges without a scratch as the sole survivor of a horrific train crash. He soon meets Elijah Price, played brilliantly by Samuel L. Jackson, a comic-book-obsessed man with a rare bone disorder that makes him incredibly fragile – the polar opposite to Dunn’s seemingly unbreakable body. As in The Sixth Sense, Shyamalan again makes use of color to set the tone of the scene, this time relying on muted cool colors and, when representing Elijah, the color purple. Shots have a comic book panel-like composition, like an earlier version of The Dark Knight and its stylized noir influence. James Newton Howard’s score is also worth mentioning, as it is absolutely fantastic, adding the right hint of nuance to emotional scenes and often enhancing the mood generated by the shot itself. Personally, Unbreakable is my favorite Shyamalan movie. What pushes it above The Sixth Sense is the way it delights in subverting audience expectations about superhero movies. Where most superhero movies are big-budget, action-packed blockbusters, Unbreakable is more of a quiet examination of the human condition behind superheroes. After Unbreakable, the stakes were even higher for M. Night Shyamalan. Surely nothing can go wrong at this point. Shyamalan made two classic movies in a row — it can’t go downhill yet. Placing Signs in M. Night Shyamalan’s catalog quality ranking is tricky. Granted, it’s not as terrible as movies like Lady in the Water or The Last Airbender, but it falls short of his previous output. At its best, Signs stands as a sign (pun definitely intended) of the oncoming quality drop of Shyamalan’s films. There are some things that Signs does right. The cinematography behind it is, as usual, excellent — say what you want about the story and acting quality of his later movies, but the cinematography has, for the most part, been consistently good. Joaquin Phoenix gives a notable performance, bringing humor and humility to a movie that could have done just fine without them. Is the humor really necessary in an alien-invasion thriller film? No. Does it work? For the most part, yes. Also, the chemistry Phoenix has with Mel Gibson is definitely noticeable, and it makes the film a lot better than it could’ve been. In the end of the movie, we find out that the invading aliens are harmed by water. Putting aside the fact that water is a pretty ridiculous weakness, the overall logic of the aliens coming after Earth is pretty flimsy. I know the aliens didn’t take earthling science classes, but the fact that the planet they are invading is 70% water, the thing that can kill them pretty easily, shouldn’t be too hard to notice when looking at the planet from up above. So why then would a species of alien that is smart enough to have mastered interstellar travel be dumb enough to attack this planet? It just doesn’t make sense. Signs is forgivable. Every filmmaker has a misstep or two in their career. Francis Ford Coppola had The Godfather Part III. Steven Spielberg had War of the Worlds. The Coen Brothers had The Ladykillers. Signs is just one small speed bump on the road to greatness. Right? Unfortunately, no. It only gets worse from here. The Village is slightly longer than the time it would take to watch paint dry and only marginally more interesting. Like Signs, it’s a movie that looks good, but when you start to think about important things like plot, the movie falls apart. Out of a 108-minute runtime, there’s maybe only about 20 minutes of stuff that matters. The “twist” ending is also weaker and more devoid of logic than that of Signs. Okay, I suppose I can get behind the titular village actually being hidden inside a walled-off nature preserve. What I can’t get is why and how. What did the elders of the village plan to do after they died? Would they let people leave the village? Would they pass the truth on to someone else and then blindly trust that whoever they told wouldn’t tell everyone else? And also, if they started the village because they didn’t like the way the modern world was, were there other suggestions before deciding on an 1800s village? Maybe someone should have suggested trying to make a difference, something like becoming a politician or activist or something. There are plenty of other ways to deal with the state of modern life. The Village is pretty bad, but unfortunately we’ve only begun to delve into the bad Shyamalan movies. Lady in the Water is one of the most vapid and self-indulgent movies I have ever had the displeasure of witnessing. There are so many flaws in this “film” that I don’t even think I could name them all. I’ll try to point out the most glaring ones. First off, the extreme self-indulgence that permeates the entire movie. This flaw is one that comes through when you learn about the character Shyamalan plays in this movie – for the first time, he gives himself a significant supporting role, rather than just a cameo. He plays a writer whose works will change the world, though no one knows it yet. Shyamalan also wrote this movie, which makes it far less coincidental that he himself plays the inspiring writer. Sure, maybe The Sixth Sense and Unbreakable, movies that most people might actually call good movies, could be influential on people. But looking at what came after Lady in the Water, the chances of Shyamalan changing the world through his writing are gone, leaving this empty, hollow shell of a self-indulgent prediction lingering in the air. Speaking of bad characters, let’s talk about pretty much every character in the movie. Every character is paper-thin, and they’re written like we’re only supposed to think what the movie tells us to think of them. For example, the film critic character, who is played as arrogant and self-assured by Bob Balaban, and is also the most overtly indulgent character aside from Shyamalan himself. It’s obvious from the get-go that we are supposed to hate this character, but we’re not left to form our own feelings of him. The allegory of the character is clear: he is meant to represent Shyamalan’s critics, who were pretty scathing after The Village. The character’s violent end is also an obvious reference to what Shyamalan plans/hopes for his critics. What’s the most basic part of a movie? The answer is plot, which is also pretty bad in this movie. Shyamalan tries to establish a world and a mythology, but he doesn’t try to make us care about them. The only stakes in the film are related to the Narf played by Bryce Dallas Howard. There’s no overall effect on our world. As Dr. Manhattan said in Alan Moore’s Watchmen: “Why should I save a world I have no stake in?” This is a question that should be asked of the characters who try to help the Narf, but it never is and as thus there doesn’t seem to be a motivation besides simply wanting to help for some thinly logical reason. After Lady in the Water, a lot of people lost faith in M. Night Shyamalan. There were also many who still clung to some shred of hope that he could return to his glory days. Don’t worry. Those people will jump ship soon enough. The Happening is one of the funniest movies of all time. Quick, what are some of the best comedies you’ve ever seen? Airplane!? Tropic Thunder? Vacation? Well, forgot about all of those, because this one trumps them all. Which would be fine if this were meant to be a comedy. But it’s not. Wikipedia labels it as a “science fiction thriller film,” but the fact that it doesn’t really feel like a thriller is a testament to how poorly made it is. The acting is laughably terrible, the plot is atrocious, the dialogue sounds like it was written by a child, and the tone constantly switches between being super serious and being lighthearted, which is really jarring. Simply describing how bad the acting and dialogue is in this movie isn’t enough. To really understand, you have to see and hear it. Take a look. Do you get it now? Do you see how lame Mark Wahlberg – who has some acting chops – is in this movie? Do you hear how laughably atrocious the dialogue is? You should. But all of that is only the beginning. The plot, for how terrible it is, is only the second-worst part of this movie. The whole “plot” of this movie is a mysterious airborne virus that essentially makes people kill themselves. But go ahead and take a wild guess where the virus comes from. Actually don’t, because all of the rational explanations you will come up with will be wrong. The virus comes from plants. First of all, why? Out of all the things that could be responsible for a deadly virus, why plants? As if that wasn’t bad enough, the virus always manifests as the wind, which the characters in the movie run from. You don’t run from the wind. That is not in any way how wind works. At the end of the movie, instead of a trademark twist, the movie just sort of ends. Like, first the thing is happening, and then it isn’t. There isn’t some big deal made about it. It just ends. With a movie this bad, the least there could be is some sort of payoff, something to make it all worth it. But there isn’t. It just ends. The Happening is a trainwreck, a massive waste of talent and resources and time, with terrible performances and dialogue strung together with a ridiculous and paper-thin plot. I hope you like that sentence, because you’ll be hearing it again with this next movie, which is arguably the worst M. Night Shyamalan movie. What can be said about The Last Airbender other than that it’s terrible? If the title sounds familiar, perhaps it’s because you’ve heard of the show upon which the movie is based, Avatar: The Last Airbender. I’m going to get one thing out of the way: I absolutely adore the series. It was a staple of my childhood, and I own the box set of the entire series. That being said, I feel I can reasonably make a statement: this movie is not The Last Airbender. Sure, the basic plot is there, but the movie is basically an adaptation of the show without any of the quality, charm, humor, heart, and diversity of the show. There is so much wrong with this movie. The story is a barebones version of the first season of the show, with pretty much all of the best subplots stripped away and with events changed entirely. In the beginning of the movie, for example, Katara is shown to already be pretty adept at waterbending, though in the show she doesn’t really become skilled until the end of the season. The names of most characters, like Aang, are mispronounced. The child actors are terrible, and the adult actors are trying their best but are dragged down by the horrendous writing. The visual effects are so obviously CGI and as such feel strange and unnatural. The 3D (yes, I was lucky enough to see this trainwreck in theaters in 3D) is misused, probably due to the 3D being an afterthought in post-production to try to bring in more ticket money. This entire movie feels like Shyamalan saw the first episode of the series, looked up a summary of the first season online, and then decided to write a script for it. Until FANT4STIC, no other movie based on a beloved franchise ever disappointed and angered me so thoroughly. The only positive thing I can say about this movie is that at least the score by James Newton Howard is good as his scores usually are. But it becomes hard to fully appreciate the score when it’s buried under a mess of a movie like this. To summarize: stay away from this movie. And if you have to watch it, watch it as a comedy. Don’t take it seriously. After all, no one else in the movie ever did, and look how it worked out for them. There isn’t a lot I’m going to say about this movie, partially because this article is long enough as is, and also because the same complaints I would make about After Earth are also the same complaints I’ve been making about the last few Shyamalan movies, especially in regards to plot, dialogue, and acting. Part of me doesn’t want to blame Shyamalan for how much of a mess this movie is, since he only made the movie because Will Smith wanted to make his son Jaden a star. Speaking of Will Smith, he’s the most disappointing part of this movie. Smith is one of the most charismatic actors in Hollywood, and this movie makes him into a angry shell who spends the entire movie looking bored. His role in the plot is to take a back seat so Jaden can shine, but Jaden doesn’t shine. He simply doesn’t have his father’s talent for carrying a blockbuster action movie. Maybe under better direction he could do better, but with M. Night Shyamalan at the helm it all falls flat. There are a lot of people who say this movie is worse than The Last Airbender, but I disagree. The Last Airbender has a lot more at stake, being based on a beloved TV show and besmirching the legacy of said show. No one expected After Earth to be good; even Sony, the studio that financed the movie, left Shyamalan’s name out of all the marketing for the movie to try to fool people into spending money to see it. But it didn’t work. It flopped here in the States and gave the world another reason to hate M. Night Shyamalan. Even Will Smith, the only reason this movie was made in the first place, hates it, calling it “the most painful failure of my career” in a February 2015 interview with Variety. 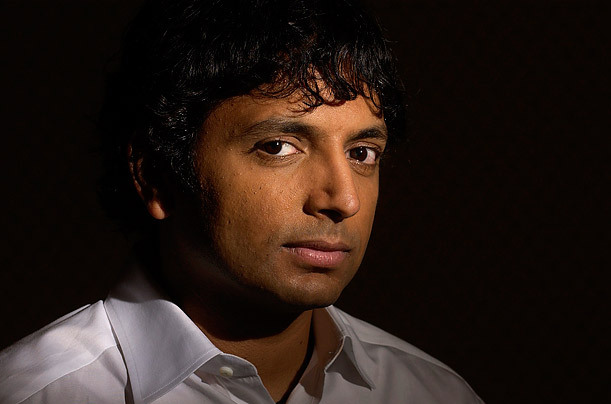 With his career in total shambles, the world’s eyes were on Shyamalan once again. But unlike in his early career, the eyes aren’t waiting for the next masterpiece. The eyes are waiting for the next flop, the next nail in M. Night Shyamalan’s massive coffin. The stakes were high; everyone expected him to fail, and he tried to reassure us that he wouldn’t. After three years, the product of his reassurance graced us with its presence. Honestly, The Visit is kind of hard to describe. It’s not great, but it’s also not terrible. My main problem with this film is the tone. It’s been described as a “horror-comedy,” but I personally found that the jokes in the movie didn’t really hit as well as they should’ve for me to consider this as a comedy. This is probably Shyamalan’s best attempt at thriller/horror type of movie since Signs. There are actually a lot of really creepy moments scattered throughout the movie, the most memorable being those that occur during the last thirty minutes or so. The found-footage filming style is something that, more than any other type of movie, can go so wrong. Thankfully, this movie manages to avoid most of the pratfalls that come with the style, and the use of the style is acceptably justified in the movie, which saves it from being more than just a cheap, money-saving gimmick. The lack of music in the film also helps with the story setup, lending credibility to the concept of the film being part of a documentary made by an aspiring young filmmaker. The Visit also includes Shyamalan’s best use of child actors since Signs. Wait, I’m comparing this to Signs too much, aren’t I? Actually, Signs is sort of a perfect indicator of the quality of The Visit. Both movies are pretty middle-of-the-road quality wise, but it’s clear that there was actual effort put into both. More so than with Signs, an okay movie is welcome, given the context of where Shyamalan’s career was previously. The Visit is elevated by what came before it. Which brings us back full circle. Throughout this, we’ve seen Shyamalan go from the highest mountains to the deepest pits and everything in between. But he never gave up. He never stopped making the movies he wanted to make, regardless of what people thought of him. At the same time that Shyamalan has been a good example of what can go wrong with aspiring young filmmakers, he’s also been a model of unyielding dedication. As he was relentlessly attacked from all sides, he continued defending his work, unwilling to back down. I truly believe, in the bottom of my heart, that M. Night Shyamalan is perfectly capable of returning to his glory days. The Visit is a proof of that faith. The Visit shows that he never totally forgot what he was best at. The Visit shows that he is ready and willing to change his career choices for the better. The Visit shows more than anything that he still cares. And in a world where he made The Last Airbender, isn’t that enough? I think it is.